Jason and I are pleased to introduce the newest member to the Beaudette-Towle family…Carl! well this isn’t really Carl, but it looks just like him (except he’s a darker grey). 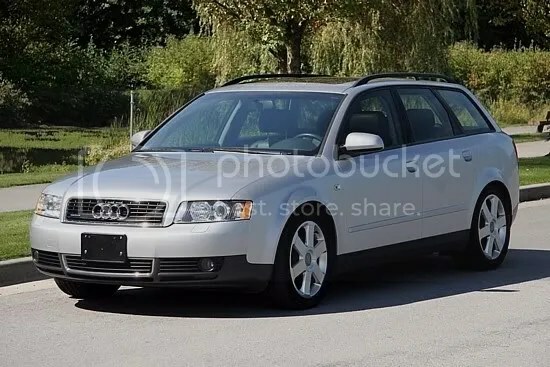 Carl is a 2003 new to us Audi A4 Avant. My dear husband finally won…he’s been trying to trade Domenic (my 2001 Civic) in for years. He final convinced me with the baby argument…rear-facing child seat and a two door coupe…imagine the fun. Anyhow the deal is not set in stone yet. But if all goes according to plan Carl will be Jason’s new car on Wednesday next week (and he is more than capable of handling both dogs and a baby seat), and the Forester will become my car (I am happy with this as the Audi has leather seats and I hate leather seats so I’m content to keep frumpy old Forest).